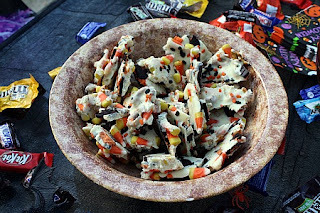 Whether you’ll be partying with or without the kiddies, this snack is sure to be a hit. Plus, it takes about 10 minutes to make. Can’t beat that! Wish I had some more of this right about now. The perfect sweet treat this Halloween! Line a baking sheet with wax paper. Crush the cookies and scatter them around the pan, followed by pretzels and half of the candy corn. Melt chocolate in a saucepan over medium heat, stirring constantly and carefully watching since white chocolate burns easily. Add half and half a little at a time to keep consistency somewhat thin. Pour chocolate evenly over ingredients in pan. Use spatula to spread if necessary. 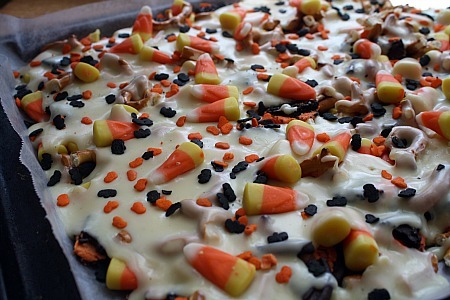 Immediately top with remaining candy corn and sprinkles. Place pan in refrigerator or freezer to firm up. Break into rough pieces and serve, or store in airtight container. 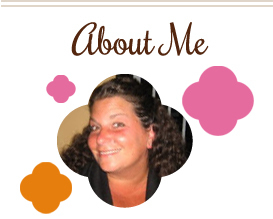 This entry was posted in candy, chocolate, dessert, QuickAndEasy, snacks. Bookmark the permalink. 5 Responses to Scary stuff! This is totally the kind of thing I could get addicted to. Fabulous. This looks soo good! I’ll definitely be making it for my Halloween party this year – thanks! This looks so festive and yummy! Would have made a great addition to the Halloween snack bags I made for my 6 year olds class. Will have to save it for next year!